CA-1 was the contract number allocated to the first order for Wirraway aircraft, an Australian-built version of the North American Aviation NA-16-2K advanced trainer and basic combat aircraft. The development of the Wirraway is inseparably linked with the birth of the Commonwealth Aircraft Corporation. During the mid-1930s several business leaders and politicians realised that Australia lacked the ability to produce modern military aircraft, and this may leave the country in a vulnerable position if war broke out and traditional supply sources were cut. Until that time, the fledgling RAAF had relied upon British companies to supply all of it's aircraft, in line with government policy of the time, and Australian companies were only capable of assembling small numbers of aircraft from parts or carrying out repairs. So in co-operation with the government, a group of business leaders (including Essington Lewis from Broken Hill Proprietary, Laurence Hartnett from General Motors Holden and William Robinson from Broken Hill Smelters) formed a syndicate in February 1936 to study whether it would be possible to develop a self-sufficient aircraft industry in Australia, based on local raw materials and industrial facilities. The announcement predictably drew the consternation of aircraft producers and politicians in Britain, the British Board of Trade expressing on February 20th that it was "strongly opposed" to the move. The involvement of an American corporation (General Motors, through it's part-ownership of General Motors Holden) also became an issue, with the British military refusing to allow British companies to divulge any technical secrets to an Australian company which was partly owned in the US. In fact the leadership of the syndicate fully expected that the first design selected for manufacture by the proposed company would be a general purpose or training type, rather than the latest fighter or bomber aircraft. The technical committee left Melbourne for their tour on February 19th 1936 and returned on July 14th. On returning from their tour, Wackett reflected that in his opinion the RAF was "in the front rank" of air forces around the world. However the committee unanimously recommended the new NA-16-1A design from the recently formed North American Aviation Incorporated (NAA) in California, together with the single-row Wasp radial engine from the new Pratt & Whitney Aircraft Company in Connecticut. This selection caused further uproar in the United Kingdom, where it was expected that a British design would be selected for production by the new company. The committee were asked to re-consider their selection by the Air Board (the controlling body of the RAAF), and during October and November 1936 the British government exerted much pressure on the Australian government to reverse the decision and construct a British design instead. But following an explanation of the facts behind the decision the Air Board threw it's support behind the selection. Further controversy followed when it was revealed that General Motors (the US parent of General Motors Holden) also held 30% of the shares of NAA. Despite the technical merits of the NA-16 design this was a clear conflict of interests and GMH offered to withdraw it's interest in CAC, but eventually remained involved with a smaller share-holding. The technical skills in light manufacturing which GMH could bring to the project were critical to it's success. The NA-16-1A was a two-seat basic training (BT-type) aircraft design developed from the NAA NA-16 demonstrator. The NA-16 was the first aircraft designed by NAA, developed as a private venture aimed at export markets as well as the US military. 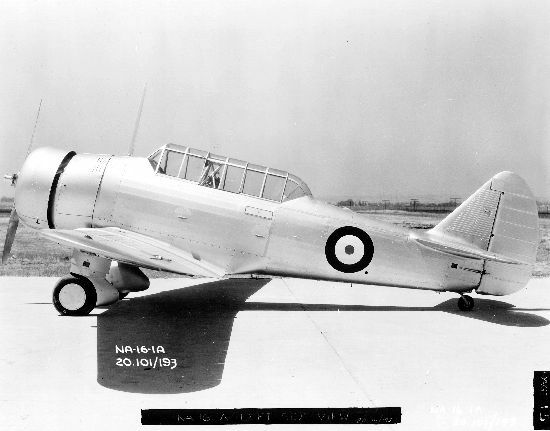 The NA-16 first flew on April 1st, 1935 in an open cockpit configuration with fixed landing gear, powered by a Wright R-975 radial engine. Marketing brochures produced by NAA at the time showed a planned range of aircraft based on the NA-16 which included a 2-seat bomber (with longer wing-span), a single-seat fighter (with reduced wing-span) and options for retractable landing gear. NAA entered the NA-16 in a competition for a Basic Trainer aircraft run by the US Army Air Corps at Wright Field in May 1935, and although the NA-16 did not win the competition an order for 42 BT-9 aircraft resulted due to it's good performance and possibly the political clout of General Motors. The project to develop the NA-16-1A for CAC was given the NAA accounting code NA-32, so as well as it's official NAA designation of NA-16-1A it was also known by this NA-32 code. To confuse the situation further, the popular press in Australia shortened the official NA-16-1A designation and referred to the design as simply the NA-16 (even though this was actually a different aircraft). The NA-16-1A was almost identical to the NJ-1 (NA-28) advanced training aircraft ordered by the US Navy and the Y1BT-10 (NA-29) demonstrator developed for the Navy by NAA. It featured fixed landing gear, a single gun firing forward through the propeller, a rear-firing gun on a flexible mount in the observer's cockpit and the more powerful R-1340 Wasp engine from Pratt & Whitney (the engine supplier favoured by the US Navy). During the later half of 1936 the original three syndicate members were joined by Imperial Chemical Industries A.N.Z., the Electrolytic Zinc Company of Australasia and The Orient Steam Navigation Company and the creation of a company to produce aircraft and engines was initiated. The Commonwealth Aircraft Corporation Pty. Ltd. was registered in Victoria in October 1936. In January 1937 the Lyons government defended it's action in selecting the NA-16-1A design with a statement by the Minster for Defence Archdale Parkhill justifying the selection of the NA-16-1A on the grounds of urgency and the lack of a suitable British design. "You are aware that is has been the policy only to use approved types of British aircraft and engines for the equipment of units of the Royal Australian Air Force and for this reason the Government has given serious consideration to your proposals which involve the introduction of foreign, in preference to British, types of aircraft and engines. Owing, however, to the abnormal position now being experienced in the British aircraft industry it is agreed that the proposals submitted by your Company offer the most satisfactory means of establishing the industry expeditiously and on a sound basis." On the basis of this letter, CAC set about organising materials, machinery, suppliers and a workforce to commence production of the NA-16-1A. CAC ordered one NA-16-1A aircraft for evaluation purposes. North American Aviation produced this aircraft under the accounting code NA-32. Only one NA-16-1A was produced, with the NAA serial number 32-387. This photograph shows the NA-16-1A is shown in California prior to delivery to Australia. Lawrence Wackett returned to the United States in March 1937 to make arrangements for licensing the NA-16-1A design to CAC and to purchase production equipment for the new CAC factory, which was under construction. On his arrival he discovered that since his first visit, NAA had developed several improvements to the NA-16 series (including retractable undercarriage and a more powerful engine and a range of armament options) which changed the character of the aircraft from a "basic trainer" (BT) type to a "basic combat" (BC) type. Adding these improvements to the NA-16-1A design under the project accounting code NA-33, resulted in a new design that was designated NA-16-1K by NAA. Wackett left the US with license rights for CAC to manufacture both the NA-16-1A (NA-32) advanced trainer and the NA-16-2K (NA-33) basic combat designs. The license deal signed on March 10th 1937 included a fee of US$100,000 for the two designs, US$30,000 for the specifications and manufacturing data, a US$1,000 royalty for each of the first 25 aircraft produced and a US$600 royalty for each of the subsequent 75 aircraft produced. The NA-16-1A arrived in Australia in August 1937 and made its first flight on September 3rd in the hands of Squadron Leader F.R.W. Scherger. Flight tests at Point Cook continued until September 15th. In late September 1937 CAC submitted a proposal to the Air Board that the RAAF should purchase the NA-16-2K aircraft rather than the NA-16-1A, since it could carry out advanced training duties as well as basic combat duties with it's expanded capabilities. The Air Board asked CAC to provide one of each design so that comparative performance tests could be carried out to justify the extra cost of the NA-16-2K, which was being offered by CAC at £8,098 (compared with the NA-16-1A at £7,200). The NA-16-2K arrived in Australia in mid-November. CAC also ordered one NA-16-2K aircraft for evaluation purposes, produced by NAA under the accounting code NA-33 (serial number 33-388). It arrived in Australia in November 1937. The NA-16-2K featured retractable landing gear, a geared engine driving a three-bladed propeller at 66.6% of the crankshaft speed and several other improvements over the NA-32. "I approve of the Air Board's recommendation that the type of aircraft to be ordered should be the N.A. 33. There is no objection to the Company being advised accordingly, but before the order is confirmed at £8,098 each for the machines and £2,200 for the spare engines, I desire the Air Board to furnish all evidence it is able to obtain supporting the reasonableness of the prices quoted." Following this decision, the RAAF placed an order with CAC under Contract Demand T.374 on March 15th 1938 (the order also included 10 spare Wasp engines). The unit price for each aircraft was £8,098 and the total cost for the order was £349,920. 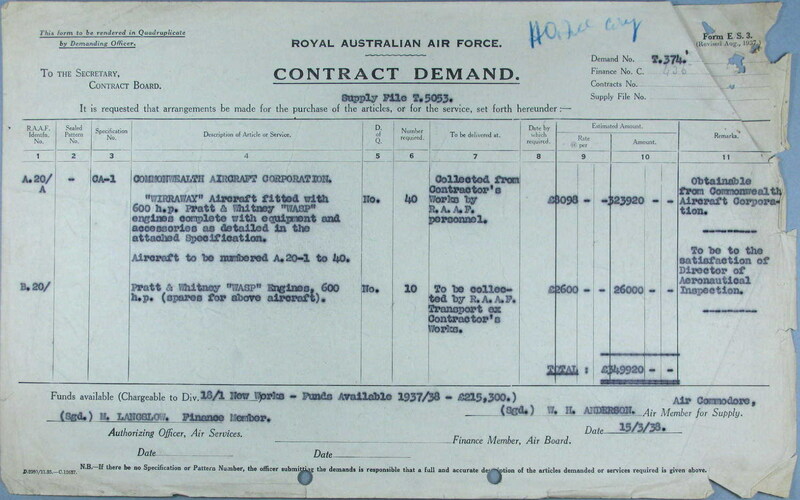 A copy of Contract Demand T.374 issued by the RAAF on March 15, 1938 for the first 40 Wirraway aircraft, which would be produced by CAC under the project code CA-1. excluding duty, but including special armament, navigation and wireless equipment to the value of £281. In view of the fact that the performance and type of construction of the Wirraway are superior to the Demon, it appears that the quotation of £8,098 for the Wirraway is reasonable, particularly as it will be manufactured locally. The Air Board's recommendation is accordingly approved, and authority is given for the order of 40 aircraft , at £8,098 each, and 10 spare engines, at £2,600 each, to be placed with the Company for early delivery. The choice of the name "Wirraway" (from the Woi Wurrung language group of the local Wurundjeri Nation, meaning "to challenge" in English) for the new aircraft was officially announced to the public by the Air Board on April 7th 1938, stories appearing in newspapers the following day. "I understand that it is intended to use it in replacement of the Demon as a fighter-bomber. I consider that the Wirraway should be regarded as a temporary expedient... it can only be regarded as an advanced training aircraft." This will mean the cancellation of an order which the Commonwealth Government had intended to lodge early next year for 60 or 70 additional Wirraways. In reaching this decision the Government has been influenced by the statement by the British expert, Sir Edward Ellington in his report on the R.A.A.F. to the Prime Minister (Mr. Lyons) that the Wirraway has insufficient speed for a fighter, but is quite suitable for training". As it turned out, the Government did not accept Ellington's recommendation, and additional orders for Wirraway production continued after the CA-1 order. Of course this new supply chain could not ramp up all of these these new technologies in time for production of the first aircraft, and a number of the first aircraft off the production line were assembled using many imported components from NAA. As the first Wirraway was nearing it's first test-flight, public interest intensified and newspapers reported progress on a regular basis. The first flight was announced for March 25th 1939, but problems with the landing gear caused a delay of two days. When the Wirraway made it's first flight it is obvious that the undercarriage doors were not fitted. Just over one year after contract demand T.374 was issued, the first CAC-built Wirraway took to the air on March 27th 1939 in the hands of CAC test pilot Hubert Boss-Walker. 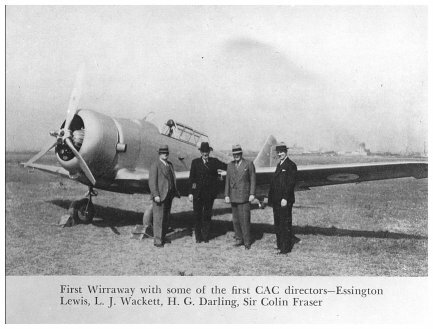 The first CAC-built Wirraway (A20-3) on the day of it's first flight, March 27th 1939. Notice the lack of undercarriage doors, armament and antenna mast. Image copyright unknown, linked from the Owen O'Malley & 462 Squadron website. By the declaration of war on September 3rd 1939, the RAAF had taken delivery of 7 Wirraways. A flight of three CA-1 Wirraways (A20-4, A20-10 and A20-11) of 22 Squadron near Point Cook. Note the original style air cleaner (single intake) under the cowl. The closest of these three aircraft, A20-10, is held in the collection of the Australian National Aviation Museum in Moorabbin, Victoria. Although it appears to have a 2-bladed propeller, Wirraway aircraft were fitted with 3-bladed propellers - the appearance is only a photographic illusion. Image linked from the RAAF historical image archive. Powerplant: 1 × Pratt & Whitney R-1340 S1H1G super-charged 9-cylinder radial engine of 600 hp (450 kW) driving a 3-bladed De Havilland propeller via a 2:3 reduction drive (the propeller spins at 66.6% of crankshaft speed). 1 × 0.303 in (7.7 mm) Vickers GO (gas operated) No. 1 Mark 1 machine gun on a flexible mount in the rear cockpit. Later in their service life some CA-1 aircraft were modified to carry 2 x 0.303 in (7.7 mm) Browning Mk II machine guns under the wings, with ammunition carried inside the wings. On aircraft A20-30 to A20-42 the inboard universal carriers are strengthened to carry 500 lb S.A.P. bombs, in which case the maximum bomb load is 1,000 lbs. A dramatic picture of preparations for a night flight in a CA-1 Wirraway showing the single air intake for the oil cooler under the cowl. Note also that there is no air intake on the upper starboard side of the cowl (in the 10 o-clock position when viewed from ahead). The ribbed housing for the propeller reduction gears is also prominent on the Pratt & Whitney Wasp engine. 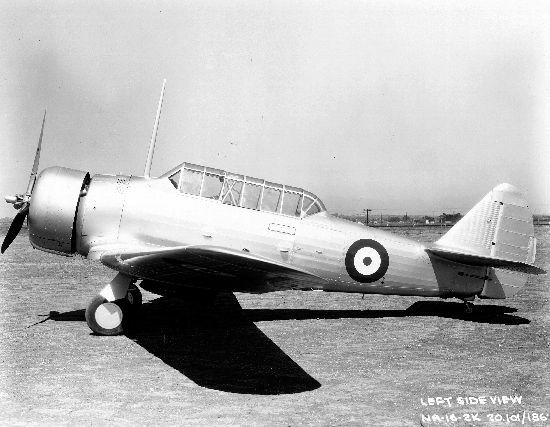 The first CA-1 aircraft delivered to the RAAF were A20-4 and A20-5, handed over on July 7th 1939. Deliveries continued until the last CA-1 (A20-43) was accepted on February 21st 1940. RAAF strength of CA-1 Wirraways peaked at 39 aircraft (since A20-20 was struck off charge while other CA-1 aircraft were still being delivered). The last CA-1 to be struck off charge by the RAAF was A20-13 on May 3rd 1960, so CA-1 Wirraway aircraft were operated by the RAAF for a total of 22 years and 2 months. One CA-1 (A20-28) was converted to CA-20 specifications and served with the RAN Fleet Air Arm and one (A20-31) was allocated to the United States 5th Air Force for a period of time. Of the 40 CA-1 aircraft produced, 14 were destroyed in crashes (including one lost on a ferry flight from Port Moresby to Tanamerah) in which 21 airmen lost their lives. 1 A20-3 01/08/1939 17/10/1945 The first Wirraway produced by CAC. Deployed to Darwin in September 1939 with 12 Squadron. 3 A20-5 12/07/1939 27/05/1940 Deployed to Darwin in September 1939 with 12 Squadron. Crew Arnold Dolphin (pilot) and Harold Johnson (observer) were killed when the aircraft crashed at Darwin civil aerodrome. 4 A20-6 30/08/1939 13/02/1952 Deployed to Darwin in September 1939 with 12 Squadron. 5 A20-7 30/08/1939 19/07/1945 Deployed to Darwin in September 1939 with 12 Squadron. 6 A20-8 30/08/1939 27/08/1942 Deployed to Darwin in September 1939 with 12 Squadron. 8 A20-10 07/09/1939 25/03/1960 On static display at Australian National Air Museum, Moorabbin, Victoria. 12 A20-14 21/09/1939 20/01/1942 Destroyed in a mid-air collision with A20-228 on 29/12/1941 over Wantabadgery, near Junlee NSW. Pilot F/Sgt W.H. Jones and observer LAC V. Vickers were both killed. 13 A20-15 02/10/1939 29/05/1940 Destroyed in a crash on 29/05/1940 at Southport, Queensland. Killed were pilot P/O K.A. Goman and observer W/T P.J. Pritchard. 15 A20-17 10/10/1939 20/08/1940 Destroyed in a crash near Hazelbrook, NSW in the Blue Mountains on 1 August 1940 in foggy conditions. The pilot Flying Officer Harry Thomas Hopgood and observer Sgt Vincent Charles Monterola were both killed in the crash. 16 A20-18 16/10/1939 23/08/1954 Modified to CA-20 standard and transferred to RAN. 17 A20-19 20/10/1939 26/11/1942 Destroyed in a crash 23/05/1942 near Warral (close to Tamworth, NSW). Pilot F/O D.S. Ambrose and observer P/O F.C. Fenly were both Killed. 18 A20-20 30/10/1939 15/01/1940 Destroyed in a crash 2 miles north of Laverton airbase on 15/01/1940. The pilot P/O J.N. Alexander and observer Temp/Sgt W.K. Platt were both killed. 19 A20-21 30/10/1939 08/08/1942 Destroyed in a crash on 08/08/1942 near Tamworth, NSW. The pilot F/Lt C.A. Dawson and observer LAC G. Patterson were both killed in the crash. 21 A20-23 12/11/1939 30/10/1951 Converted to CAC Ceres CA28-21. 23 A20-25 21/11/1939 17/12/1940 Destroyed in a crash 2 miles west of Brucedale on 17/12/1940. Pilot Lac J.G. Lemon was killed. 26 A20-28 01/12/1939 25/08/1952 Converted to CA-20 and served with the RAN. 29 A20-31 22/12/1939 18/03/1944 Issued to USAAC 5th Air Force June 1943. Returned to RAAF March 1944. 30 A20-32 12/12/1939 12/05/1952 Converted to components. 31 A20-33 20/12/1939 30/08/1940 Destroyed in a crash during a solo night training flight near Wagga. Pilot LAC T. Tweedie was killed in the crash. 32 A20-34 22/12/1939 30/04/1942 Destroyed in a crash near Deniliquin. Both crew members LAC R.W. McKay and LAC L.S. Simmons were killed in the crash. 33 A20-35 12/01/1940 31/12/1941 Destroyed in a crash near Shepherd's Siding. Pilot LAC M.A. Lowe bailed out and was OK.
34 A20-36 12/01/1940 10/12/1940 Badly damaged in a crash near Wagga. Both crew members F/O Grant and LAC R.D. Browne survived uninjured. Converted to components. 35 A20-37 17/01/1940 02/05/1957 Sold as scrap. 36 A20-38 19/01/1940 17/12/1951 Converted to components. 37 A20-39 02/02/1940 31/05/1957 Sold as scrap. 38 A20-40 26/01/1940 29/09/1942 Destroyed in a crash near Sackville NSW. Both crew F/Sgt Bassett and Sgt Blackburn were killed. 39 A20-41 02/02/1940 23/09/1941 Destroyed in a crash near Uranquinty NSW. Pilot LAC J.D. Mahoney parachuted safely. 40 A20-42 21/02/1940 28/10/1943 Converted to components. "AIRCRAFT BUILDING. "The Sydney Morning Herald (NSW : 1842 - 1954) 18 Sep 1936: 11. Web. 22 Mar 2012 <http://nla.gov.au/nla.news-article17279448>.